To Cite: Ebrahimi E, Farouee Firoozi A. The Impacts of Parenting Style and Perceived Childhood Attachment on Children’s Concept of God, Iran J Psychiatry Behav Sci. Online ahead of Print ; 13(1):e1579. doi: 10.5812/ijpbs.1579. Background: Children are first educated in their families. Parents by adapting different parenting styles consciously and in most cases unconsciously teach their children important educational doctrines. Objectives: This study aimed to determine the impacts of parenting style and perceived childhood attachment on children’s concept of God. In this descriptive correlational study, 375 students of Islamic Azad university of Birjand were selected via multi-stage sampling. Materials and Methods: The subjects completed the questionnaires related to parenting style, perceived parental attachment, and concept of God. The obtained model was a good fit for the data, and the psychological pattern revealed that controlling parenting style (insecure mother-child attachment) promotes dependence on God and encourages the perception of God as a controller. Also, supportive parenting via forming parent-child attachments (insecure father-child attachment) could predict the child’s view of God as a controller. Results: Good parenting style was not directly correlated with the perception of God; however, it could improve one’s positive perception of God through increasing or decreasing attachment to parents. In addition, poor and rejecting parenting style both directly and indirectly affects the concept of God by increasing children’s mistrust toward parents and decreasing dependence on God. Conclusions: Uncaring, rejecting parenting style is more remarkable in decreasing positive attitudes toward God, compared to authoritative parenting style. Children are first educated in their families. Parents by adapting different parenting styles consciously and in most cases unconsciously teach their children important educational doctrines. Children’s religiosity is rooted in their interactions with the parents. Furthermore, children’s mental perception of themselves and others impacts their perceptions and behaviors in new interactions and circumstances (including religious education and forming a notion of God (1). Attachment theory deals with the study of the evolutionary basis of child-caregiver relationship and suggests that the attachment system is active from cradle to death. Thus, as children feel secure with the mother’s presence, they confidently explore the environment (2). One who believes in God, as the bringer of safety and peace, feels strong and confident in moments of fear and anxiety. One’s concept of God forms one’s world view and has a direct impact on one’s choices and orientation. Therefore, the nature of children’s relationship with parents, including attachment and parenting styles is considered a key factor for the formation of their religious behaviors. De Roos (3) considers God as a figure to whom we are absolutely attached, in desperate time; one who can ensure a sense of safety in individuals. Perhaps, this is the reason why people in critical and stressful situations resort to religion and God. Therefore, experiencing God’s affection is quite similar to child-parent attachment. Moreover, the emotional bond and excitement one feels with another is also seen in one’s relationship with God. Parent-child bonding and concept of God might be correlated in two ways. One hypothesis suggests that individuals deprived of secure parent-child relationship might compensate this shortage by conceiving God as an attainable and merciful presence. This hypothesis is against the assumption of adaptive pattern, which suggests that one’s religiosity and concept of God can partly be determined by one’s early childhood attachment; this early attachment can affect one’s religious beliefs in later stages of life (4). In the present model, these 2 hypotheses were reviewed regarding the formation of the concept of God. Sadeghi (5) also reported that the concept of God among young people was associated with parenting styles. For example, in authoritative parenting style, God is accessible and acts as the protector, while in neglecting parenting style, God is regarded as distant and unreachable by children. In other words, in an authoritative parenting style, God appears very strict, rigid, and non-negligible. On the other hand, in the supportive parenting style, God is regarded as a divine force. However, those raised by this parenting style feel that God is often unresponsive to their demands; this point supports the adaptive hypothesis (5). Likewise, Rizzuto (6) stated that people’s concept of God might depend on their interactions with parents. Accordingly, the question arises as to what factors play substantial roles in shaping one’s perception of God. Concept of God is one of the most fundamental components of human beliefs, which affect an individual’s life. Several studies have indicated the relationship between attachment and parenting styles (1, 7) as well as the association between parenting styles and the notion of God (4, 5, 7). In this study, we aimed to determine how parenting practices, which are associated with a variety of attachment styles between parents and child, are involved in shaping one’s perception of God. Several studies have evaluated the concept of God in different cultures. However, lack of such studies in Iranian samples and Islamic communities is strongly felt. And apparently, no similar empirical research has evaluated the relationship between attachment styles and concept of God in Islamic communities. In this correlational study, we aimed to determine the relationship between perceived parent-child attachment, child’s concept of God, and parenting styles. The study population consisted of undergraduate students of Islamic Azad University of Birjand. The subjects were selected via multi-stage sampling during the second educational semester of 2010. The participants completed the questionnaires, and the results were evaluated by path analysis. Parenting style scale (Schaffer 1970, quoted by Mehrafrooz, 1999 consists of 77 sentences, which evaluate two major dimensions of education, namely “control-freedom” and “love-rejection.” The sentences were graded as follows: always, 1; very often, 2; sometimes, 3; almost never, 4; and never, 5. In this study, factor analysis was performed to determine the validity of the scale. Considering the sampling adequacy (0.96) and the significance level of Bartlett’s test (P = 0.001), factor analysis could be trusted. Principal component analysis and oblimin rotation method showed a 4-factor configuration (controlling, non-controlling, affectionate, and rejecting styles). Another tool used in this study was parent-child attachment scale which includes 6 sections (3 sections for each parent), describing parent-child relationship (8). Respondents were asked to grade their childhood experiences with each parent on a scale (from strongly disagree to strongly agree). In order to overcome the limitations of psychometric analysis, paragraphs related to each parenting style were changed into individual materials (8). In this study, the factor analysis of each attachment style showed a 2-factor configuration. Finally, God image scale was applied to evaluate children’s perception of God. This scale is a reconstruction of Lawrence’s 72-point scale that has been revised by linguists. Mazaheri and colleagues (2005) reconstructed it according to the Islamic culture into a 33-point scale in 6 subscales. After reading each sentence, subjects evaluated their different moods and experiences in relation to God image by a 5-point scale (ranging from strongly disagree to strongly agree). Factor analysis was performed to determine the validity of the scale. An adequate sampling index was achieved (0.94), and Bartlett’s test results were significant (P = 0.001). Principal component analysis using oblimin rotation method also confirmed the 3-component structure (dependence on God, controlling God, and merciful God). Out of 375 participants, 175 were female and 200 were male. As demonstrated in Table 1, in terms of the mean and standard deviation of predictor variables (parenting and attachment styles) and perception of God, authoritative and supportive parenting style had the highest mean; also, among attachment styles, safe parent-child attachment showed the lowest mean. Dependence on God showed the highest mean and child’s perception of God as controlling revealed the lowest mean. The results also indicated that the relationship between attachment styles and parenting styles (except authoritative parenting) was significant. The correlations between secure and insecure parental attachment and perception of God were found to be significantly positive and negative, respectively. Also, the correlation between authoritative and supportive parenting style and perception of God was positive. However, the association between neglecting and rejecting parenting style and perception of God was found to be negative. Path analysis was used to explore the simultaneous role of predicting variables in the perception of God. For the accurate evaluation of parameters and LISREL fitness indicators, insignificant paths were omitted from the model and the parameters were reestimated. The proposed model showed a good fit for the data. Chi-square index was estimated at 46.7, and considered statistically insignificant at 0.01. Therefore, the model could provide an acceptable approximation with the society, and therefore completely fit the data. On the other hand, this model explained 36% of variance in the dependence on God, 51% of variance in the child’s notion of God as controlling, and 21% of variance in the concept of God as a merciful being. However, RMSEA index, used to measure the mean of residuals, was estimated at 0.04. The values of other fitting indicators, including goodness-of-fit index (GFI), adjusted goodness of fit index (AGFI), incremental fit index (IFI), comparative fit index (CFI), Non-normed fit index (NNFI), and normed fit index (NFI) were 0.98, 0.97, 0.99, 0.99, 0.94, and 0.98, respectively, which were higher than 9.0, representing the fitness of pattern to the data. As Figure 1 indicates, controlling parenting style leads to dependence on God due to insecure mother-child attachment. Also, supportive parenting style predicts the child’s perception of God as a controlling and merciful presence via positive parent-child attachment and insecure father-child bonding. The results also indicated that supportive parents have the most indirect effect on predicting the child’s notion of God; on the other hand, rejecting parenting style had the most indirect effect on discouraging dependence on God. In addition, the results indicated that mother-child attachment plays a more significant role in predicting the child’s concept of God, compared to father-child attachment. According to the current findings, although good parenting style is not directly correlated with the perception of God, it can improve one’s positive perception of God through increasing or decreasing attachment to parents. In addition, rejecting parenting, which refers to the parents’ negligence of children, both directly and indirectly affects the child’s notion of God (by increased mistrust toward parents) and decreases child’s dependence on God. Negative effects of neglecting and rejecting parenting style are more significant in decreasing positive attitudes toward God, compared to authoritative parenting style. In general, loving and authoritative parents by showing responsive and sensitive behaviors shape proper attachments in children and affect their notion of God. Also, the study results revealed that secure attachment formed by a loving parent plays the most effective mediating role between authoritative parenting style and the notion of God. Insecure parent-child attachment formed by a rejecting parent also plays the most effective mediating role between parenting style and dependence on God (as well as the notion of God as a controlling presence). In this regard, Bartkowski (7) believed that the notion of God in children was associated with attachment to parents and parenting styles. By referring to Bowlby’s attachment theory (1996), Kirkpatrick (1994) explained that transformational changes in parenting styles would improve the attachment style and therefore encourage a positive notion of God (9). In this regard, Kirkpatrick and Shaver reviewed the effects of parenting style and early childhood attachment on subsequent attachment to God (10). Moreover, Sroufe et al. (2006) emphasized that early parent-child relationship would be fundamental to future attachments, including parent-child relationship, romantic bonding, and one’s relationship with God (11). Grankoist and colleagues (1999, quoted by Feizabadi, 2009) stated that in the context of child attachment, bonding with parents and the notion of God would develop. In general, parenting methods form children’s attachment styles; thus, children’s perceptions of parents predict their notion of God (12). Bowlby (1973), quoted by De Roos et al. (3) argued that attachment was an emotional bond between two people. He claimed that a child creates his or her own mental model and caregivers are the first influential people in forming effective attachments. These patterns are in fact mental presentations that originate from various experiences and interactions between the child and caregivers. These mental images lead to the emergence of certain perceptions and behaviors in children in their interactions with the environment and new relationships. In other words, the mental image of God is developed in one’s interactions with others. Thus, the child’s secure or insecure attachment directly predicts his or her notion of God (3). According to the theory of thematic relations, mental presentations are not directly based on God, but are dependent on images shaped by one’s contact with important people in one’s life, especially the parents. Also, in contrast with Freud’s theory, the evolution of the God notion is affected not only by a child’s relationship with his or her father, but also by the mother-child relationship, which is another major determinant of the God notion. According to Baraki and Ball (1988), both parents can influence their child’s notion of God. An individual’s perception of God is primarily established during the early stages of life, and further changes in this concept will be caused by other influential people in later stages (11). Also, Kirkpatrick and Shaver (1992 quoted by Sepah Mansour, 2008) stated that children, who had an insecure relationship with their caregivers, had a negative notion of God, while those having a positive relation with their parents had a positive notion of God (13). However, Bowlby (1996) showed that mental images of oneself and others which originated from attachment patterns and developed in early childhood would act later as mediators between the perception of parents and God (2). Bartkowski (7) argued that attachment theory was related to parent-child relationship as a predictor of one’s notion of God. He also could interpret “substitute attachment styles” (or compensatory attachment) in children whose parents were divorced or separated. 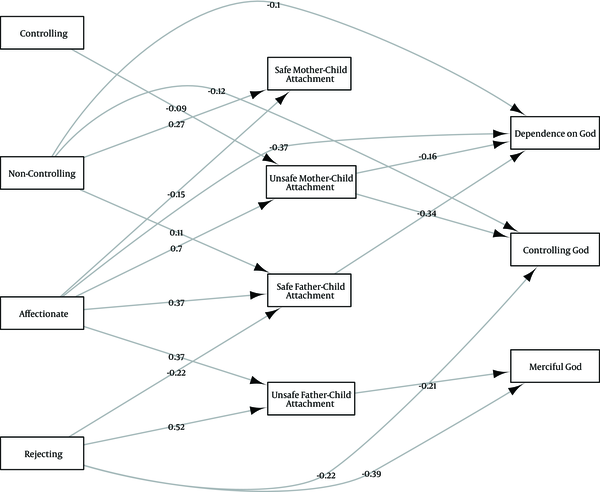 In this regard, Mazaheri (4) showed that the quality of parent-child relationship and attachment styles would affect the child’s notion of God; this finding was supported by our model. Authors’ Contribution: Elham Ebrahimi conceived and designed the evaluation, interpreted the clinical data and revised the manuscript critically for important intellectual content. Afsane Farouee Firoozi collected the clinical data and drafted the manuscript. Both authors read and approve the final manuscript. Declaration of Interest: The authors had no conflict of interest. 1. Mohamaddi Y. The condition of the impact of Birjand Families' behavioral styles on their children's self-confidences during high school in 1386-87. Birjand; 2008. 2. Jafari B. Ten steps toward improving creativity. 2016. Available from: http://www.aftabir.com/articles/view/applied_sciences. 3. De Roos S. Young children's Description of God parent's and teacher's god concept and religious nomination of schools. J Beliefs Values. 2004;22:19-30. 4. Mazaheri MA. [Parents, self, and others important: the sources of notion of God journal of behavioral science]. Tehran: Shahid Beheshti University; 2008. Persian. 5. Sadeghi M. Studying the relation between the religious parenting style and the notion of God on students. 2005. 6. Rizzuto AM. Object relations and the formation of the image of God. Br J Med Psychol. 1974;47(1):83-99. [PubMed: 4836306]. 7. Bartkowski JP, Xu X, Levin ML. Religion and child development: Evidence from the Early Childhood Longitudinal Study. Soc Sci Res. 2008;37(1):18-36. doi: 10.1016/j.ssresearch.2007.02.001. 8. Khorashadizadeh S, Shahabizadeh F, Dastjerdi R. An investigation into the role of attachment during childhood; Attachment to god, and attributional styles of social anxiety disorder of university students in birjand. Ravanshenasi va Din. 2012;4(4). 9. Kirkpatrick LA. The role of attachment in religious belief and behavior. In: Perlman D, Bartholomew K, editors. Advances in personal relationships. London: Jessica Kingsley; 1994. p. 239-265. 10. Kirkpatrick LA, Shaver P. Attachment theory and religion: Childhood attachments, religious beliefs, and conversion. J Sci Study Relig. 1990;29:315-334. 11. Sroufe LA, Fleeson J. Attachment and the construction of relationships. Relation Dev. 1986;51:72. 12. Feizabadi S. Attachment style and the notion of God among women willing to get divorce and unwilling to get divorce in Kashan. J Educ N Thoughts. 2007;3(5). 13. Sepah Mansour M, Shahabizadeh F, Khoshnevis E. [Perceived childhood attachment, adult attachment and attachment to God]. Iran Psychol. 2008;4(15):215-68. Persian.